Keckley looks over some of the collection he's amassed over the years. Modern Healthcare may have found our No. 1 fan—Paul Keckley, industry consultant and managing editor of the Keckley Report. He's squirreled away a copy of every issue of Modern Healthcare dating back to the late '70s, he estimated. 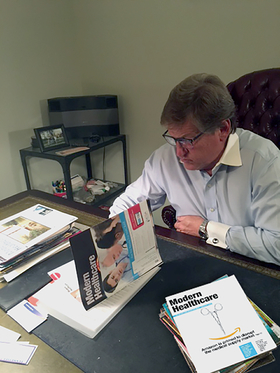 Keckley may be devoted to Modern Healthcare, but he authors a monthly column for rival publication Hospitals and Health Networks. He has also published three books and 250 articles, but says his archival collection of Modern Healthcare surpasses that of any of his own work. "I have hoarded these things, 50-plus issues a year, in several storage units. There are just some things I didn't want to give up, and Modern Healthcare issues were one of them," Keckley said. "I like to pull old issues out every once in a while to see how the industry has changed. There is not another publication that I've saved through the years, not even my own writings." Along with the Wall Street Journal, he says it's the only publication he reads cover to cover and describes what we publish about healthcare as a "very purposeful, higher calling." And the section of Modern Healthcare he enjoys the most? Excuse us if we're blushing, but he singled out the Outliers page as a favorite. "I really enjoy reading the Outliers. I read the magazine cover to cover, but I love getting to the funky stuff you guys find for the back page, especially when it is about animals. It's such a nice way to end the magazine, and often shows the more human side of the industry." His words of advice for his favorite feature? "Put more pets in the Outliers; it makes people happy." Bow-wow!